The government agency responsible for foreign investment says its client companies added a net total of 6,570 jobs. 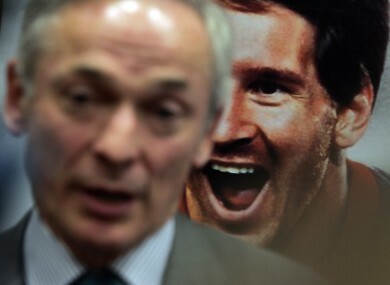 Jobs minister Richard Bruton in front of an image of Leo Messi, announcing the creation of new jobs by Electronic Arts in Galway last year. THE GOVERNMENT AGENCY responsible for encouraging foreign investment in Ireland says client companies created a total of 12,722 jobs here in 2012 – and a net total of over 6,500. IDA Ireland says 145 individual investments from overseas companies helped to offer the agency’s third successive year of growth in net employment. While some client companies cut the number of jobs they offered, the number of losses – 6,152 – was the lowest in a decade, the agency said. The creation of a net total of 6,570 jobs last year brings the total workforce of IDA clients to 152,785, the highest since the onset of the financial crisis in 2008. Jobs minister Richard Bruton said he was delighted that the IDA had secured the highest net job creation numbers in a decade, and described the investment as “a superb vote of confidence in the Irish economy and the Irish people”. IDA Ireland chief executive Barry O’Leary said Ireland had performed well “amid significant economic challenges globally and locally”. “Ireland’s leading FDI companies have strong economic substance here in terms of large scale employment and investment,” he said, before warning that Ireland faced “a highly competitive landscape, with notable strong competition arising from the UK, the Netherlands and Switzerland and many other countries’’. The agency said its 2012 statistics were notable because of the higher proportion of greenfield investments from companies such as filesharing service Dropbox, price comparison website Nextag and email marketing specialists Hubspot. These were in addition to investments by the likes of EA Games, Cisco, Apple and Eli Lilly. Its performance for 2012 means the agency is ahead of its targets under the Horizon 2020 strategy, under which it aims to create 62,000 direct jobs through 640 investments between 2010 and 2014. Having completed three of these five years, the IDEA’s gross jobs gain is over 36,000. Email “IDA-backed companies created 12,722 jobs last year”. Feedback on “IDA-backed companies created 12,722 jobs last year”.